Does a little bit of HDR go a long way? BenQ adds a touch of HDR goodness to its latest gaming-centric 32-inch PC monitor. Multiple hot new features and innovations have been rocking the PC monitor market recently. For BenQ’s latest large format and gaming-centric model, therefore, standing out isn’t going to be easy. It’s tough out there. Luckily, the new BenQ EX3203R offers an intriguing mix of features and capabilities. 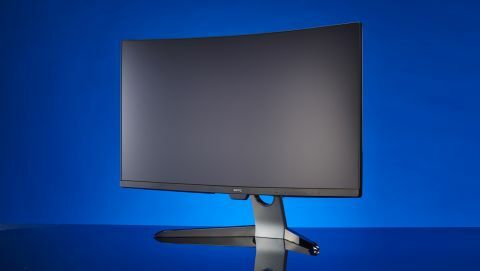 Highlights include 144Hz refresh, a curved panel, USB-C connectivity and adaptive sync support, all wrapped up in a 32-inch package. The kicker, arguably, is VESA DisplayHDR 400 certification. That’s a pretty compelling core proposition and will tick a lot of gamer’s boxes.Those looking for a more general purpose display might like the look of that feature set, too. However, at this relatively competitive price point - and arguably at almost any current price point - you can’t quite have everything. Notably, the EX3203R is what you might call a 2.5K rather than 4K or UHD monitor. It also lacks support for Nvidia’s particular take on adaptive syncing and, if you’re a fan of super-wide aspect ratios, you’re not going to find satisfaction here. On the other hand, the sub-4K resolution can make for a better fit for gaming in terms of enabling faster frame rates with any given graphics card. Priced at £499 in the UK, $699 Stateside and $799 in Australia, the BenQ EX3203R is fairly aggressively positioned, if a little more expensive in the US than other territories. Directly comparable models, such as AOC’s AG322QCX and the Asus ROG Strix XG32VQ are priced similarly but notably lack HDR support. On paper, then, the BenQ has a clear edge. The 31.5 inches of panel in a 16:9 format makes for a pretty big, bold physical presence. Aesthetically, the EX3203R is relatively restrained by gaming peripheral standards. But with slim bezels around three sides of the LCD panel and a sleek silver stand, it’s a classy affair and feels fairly expensive. That panel, incidentally, is VA rather than IPS. That helps with contrast and color saturation, but can be somewhat problematic when it comes to viewing angles and pixel response. That said, BenQ has equipped this monitor with 144Hz refresh capability and claims 4ms response capability, so in theory it’s quick. It also supports the new second generation of AMD’s FreeSync adaptive refresh technology. That adds support for HDR and wider color gamuts to the FreeSync feature set. Connectivity-wise, a pair of HDMI 2.0 ports plus DisplayPort should ensure most of your bases are covered. Even better is the inclusion of USB-C connectivity, enabling single-cable connectivity for everything from the image signal to peripherals and even charging for laptops. It’s a desirable port to have in terms of future-proofing, too. Which brings us to the EX3203R’s most intriguing engineering element, that VESA DisplayHDR 400 certification. HDR is quickly becoming a fairly bewildering technology, replete with numerous standards. But is the DisplayHDR 400 standard really true HDR? It requires, for instance, a brightness of 400cd/m2 where many would argue that the full impact of HDR only arrives at higher peak brightnesses around 1,000cd/m2. What’s not debatable is that DisplayHDR 400 is the very bottom rung of the VESA HDR ladder and the least demanding option for any given monitor manufacturer. Not only does DisplayHDR 400 have modest brightness requirements, it also doesn’t dictate local dimming and makes less stringent demands in terms of color reproduction. BenQ says the EX3203R is good for 90% coverage of the DCI-P3 profile. Fair to say, then, that DisplayHDR 400 is HDR lite. Expectations suitably managed, how does the BenQ EX3203R actually perform? Immediate impressions certainly tally with the underlying VA panel technology on offer. Colours are punchy and vibrant, whites are bright and clean, while blacks are deep and inky. The EX3203R’s panel is rated at 3,000:1 for static contrast capability and it looks every bit as good as that. The panel’s gentle curve also makes for a nicely immersive experience. What the EX3203R doesn’t obviously look like - and perhaps shouldn’t be a surprise given the realistic limitations of the DisplayHDR 400 standard - is a true next-gen HDR display. With the full HDR stack enabled, HDR content does look pretty stellar. But the EX3203R can’t compete with brighter ‘full’ HDR displays with local dimming when it comes to blowing your socks off with highlighted details popping out of dark scenes. It’s also worth noting that HDR remains a problematical technology in terms of everything from ensuring it’s enabled both on the display and in Windows 10 and having content, be that games or video, that is HDR enabled. Enabling HDR globally in Windows, for instance, makes for a rather dull look for desktop elements. HDR, in short, remains complicated and the supporting content relatively scarce. As a general purpose monitor, the EX3203R’s most obvious shortcoming is its relatively modest 2,560 by 1,440 native resolution. That makes for fairly big, coarse pixels when spread across a 32-inch panel. A high-DPI display this most certainly is not. That said, as a gaming device the lower resolution makes for pretty pleasing results. The VA panel prevents it from being at the cutting edge in terms of response. But inverse ghosting is not a major issue here and the benefits of that 144Hz refresh in terms of in-game smoothness are absolutely undeniable, even if you’ll need a powerful and pricey graphics card to make the most of it despite the restrained 2.5K native resolution. Gamers looking for a big, bold and beautiful display with high refresh rates and adaptive sync support should give the EX3203R serious consideration, albeit in the knowledge that this isn’t the most responsive monitor on the market. That you get a little bit, though not full, HDR goodness thrown in just sweetens the deal. For those looking for a more productivity orientated monitor, there are better deals elsewhere.